Is Beauty in the Soul of the Beholder? The cliché, “beauty is in the eye of the beholder,” is probably either trivially true (there can be no perception of beauty without sense organs) or else obviously false (the same thing could turn out to be both beautiful and non-beautiful). But what if we said that beauty is in the soul of the beholder? This is what Plotinus tells us (Enneads), and he is hardly a squishy relativist. Plotinus’s argument runs something like this: Qualities such as symmetry and harmony cannot be definitive of beauty because they apply only to compound objects, but not all beauties are compounds. In fact, the quality in a beautiful thing that governs other qualities, such as symmetry and harmony, is unity; but unity is properly found only in non-compound objects, such as the soul. Just as the soul imparts unity to the body, which is a compound, so form imparts unity to an artwork or natural object. The human soul thus has an affinity for the form of beautiful things—and an aversion to the deformity of ugly things—by nature. It is by virtue of this affinity for beauty residing in the soul of the beholder that beautiful things are recognized as such. Therefore—my paraphrase—beauty is in the soul of the beholder. It’s interesting to think about this in connection with a perennial problem in aesthetics: how do you reconcile the irreducibly subjective concept of taste with objective criteria of beauty in nature and in artworks? Kant wrote about this. An aesthetic judgment is subjective, he claimed, but its content is understood to be universal, or objective (Critique of Judgment). So what I mean when I say that I like a given painting is actually that it is beautiful and that you should like it, too. But at the same time, I realize that you might not like it, that taste varies. This is paradoxical, just one of quite a few paradoxes that Kant cheerfully embraced in his philosophy. But is the situation really paradoxical, or does Plotinus have a key to its solution? The faculty of taste is subjective and highly variable; it requires a person, a perceiver, a soul, that is, one who likes or dislikes, and no two persons are entirely alike. At the same time, the appreciation of beauty—whether in nature or in art—is an activity that inherently points to something outside of and beyond the person. Beauty itself is in one sense the objectification of something realized from within and manifested externally, whether by the creative artist, by the appreciative viewer or listener, or by God. In a word, to recognize something as beautiful—a painting, a song, a sunset—is to acknowledge that it pleases the human soul. And this is something that every human soul in fact does acknowledge with regard to some things. Disagreements about matters of taste presuppose some degree of universal or shared humanity, and that humanity, or human soul, is beautiful in the primary sense of the term. Other beauties are derivative from it. Or so Plotinus appears to have thought. The Golden Rule tells us, “Do unto others as you would have them do unto you.” What exactly is the Golden Rule telling us to do? There are several possible interpretations. Another interpretation is that it could be directing me to treat others as I would wish to be treated if I traded places with them while assuming all of their preferences. This leads to a more favorable outcome for my sleeping neighbor who really hates being woken up at 3:00 a.m. However, what if my neighbor is a masochist who loves being beaten, or a sadist who wants to beat me up? Surely I can’t be obligated to set aside my aversion to beating or being beaten just to humor a pervert living next door. One solution here might be to weigh and compare the preferences involved. If I really hate beating or being beaten as much as my neighbor loves the opposite, then my neighbor’s application of the Golden Rule to me would cancel out my application of it to him. After all, we both ought to be following the Golden Rule. And my sleeping neighbor’s interest in sleep is much stronger than my desire to hear loud music at 3:00 a.m., so he is not violating the Golden Rule by asking me to turn down the volume. So maybe what the Golden Rule is demanding is that I view the preferences of all those affected by an action from the viewpoint of an impartial spectator who benevolently wants to maximize the satisfaction of everyone’s preferences. Think of two people in the check-out line at the grocery store, one with a full cart and one with a gallon of milk. If I have the full cart, I should let the guy with the milk go first, even if I am next in line and have to wait a bit longer as a result. A minor wait for me is better, from an impartial standpoint, than a long wait for him. But consider a problem with this approach. Suppose I have only a moderate aversion to hurting people, while my masochistic neighbor has a passion for being beaten. If I am obliged by the Golden Rule to maximize the satisfaction of preferences, then it seems I morally ought to beat him. Surely this can’t be right. I am reminded of a line from the movie Jesus of Montreal, spoken by a female character who was having a sexual affair with a Catholic priest. When asked why she was doing this, she answered, “Because it gives him so much pleasure and me so little pain.” Was she just following the Golden Rule!??! Surely not! What have we missed? Just this, I think: The Golden Rule cannot be applied in the absence of some other moral rules for assessing preferences. Some preferences are inherently debased and have no claim on satisfaction, as with the sadist and masochist (and the wandering priest). Some desires are for things that hurt and degrade us; others are for things that genuinely build us up and help us to flourish. Perhaps the Golden Rule is really telling us to help others and not harm them, just as we wish others to refrain from harming us and to help us when they can do so at no unreasonable cost to themselves. And an important aspect of helping and harming has to do with respecting our dignity as persons. As John Stuart Mill observes in Utilitarianism, our unwillingness to sink into “a lower grade of existence” is rooted in “a sense of dignity, which all human beings possess in one form or another.” Helping and harming must be defined in terms of some account of what it means to flourish as a human being, to lead a fulfilled human life. Thus, an account of human flourishing is necessary for us to know how to follow the Golden Rule. Fr. Keefe is Emeritus Professor of Theology at Fordham University. He taught on the faculties of Canisius College, St. Louis University, Marquette University and St. Joseph’s Seminary (Dunwoodie), Yonkers, New York. 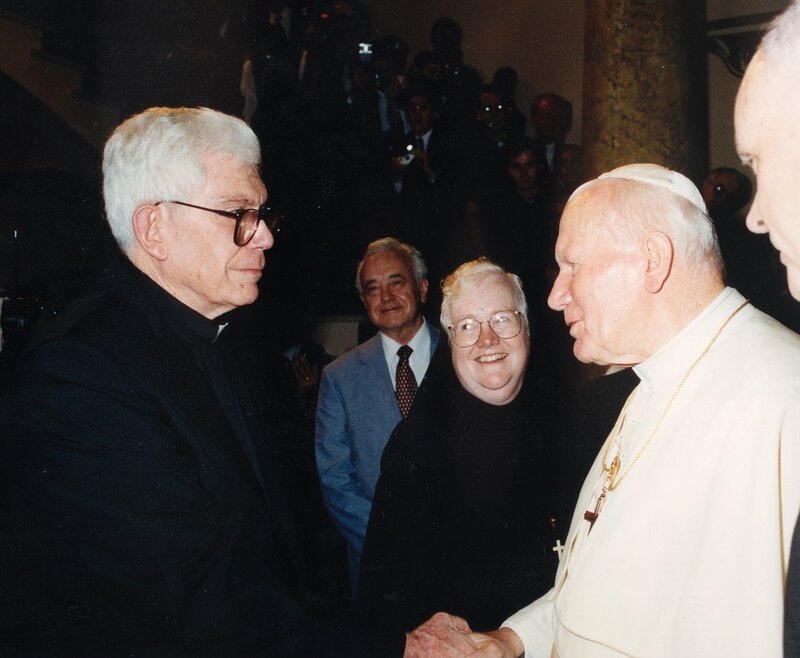 In 2002, Fr. Keefe was the Cardinal Edmund Szoka Distinguished Visiting Professor of Theology at Sacred Heart Major Seminary, Archdiocese of Detroit. Checks for $55.00 are to be made payable to Saint Anselm College. You are currently browsing the Saint Anselm Philosophy Blog weblog archives for February, 2008.